Yes, I drew sloppy stars and shapes on each box so I could match the box to the contents I entered on my moving spreadsheet. As you might remember, a week ago I spent $263.36 shipping eight boxes to Cedar Rapids via Ballard’s Sip & Ship. I also spent $55 on the Dolly that drove my eight boxes to the Sip & Ship, as well as $4.85 on the cookie I ate while I was there. You might also remember that Dolly is “what if Uber were pickup trucks.” I had used Dolly twice at that point—once for that Sip & Ship trip and once to move the contents of my Seattle microapartment (the one where I had to wash my dishes in a bus tub and dump the water into the toilet) into the one-bedroom that I will be vacating this Thursday. Both times went very smoothly; my Helper arrived on time, had enough gear to move everything safely, etc. etc. etc. Which meant that I set up two Dollys this past weekend: one to take a bunch of stuff to Goodwill, and one to take a bunch of boxes to the Sip & Ship. The Goodwill Dolly was supposed to arrive on Saturday afternoon, and after waiting for about an hour, I got a message from Dolly telling me that my Dolly had been canceled and I owed a $23 cancellation fee. I immediately emailed Dolly’s customer service and, after some back and forth, we figured out that my phone number had been recorded incorrectly in the Dolly app. (We’ll be generous and say this was my fault, since I would have been the one who typed it in.) This issue hadn’t come up during my previous Dollys because my Helpers had all messaged me directly through the app; this Helper tried to call me when he arrived at my apartment but couldn’t get through. Dolly claims he also tried to message me through the app, but I never got that message and sent Dolly screenshots to prove it. Still, since my Helper sat at my apartment for 40 minutes without being able to communicate with me, I owed Dolly $23. Dolly’s customer service told me that I had to pay the cancellation charges but, due to the confusion, they’d give me $20 off the Dolly I had scheduled for Sunday afternoon; the one that was supposed to take my stuff to the Sip & Ship. Spoiler alert: it doesn’t, but we’ll get to that. After my conversation with customer service, I set a new Dolly request for Sunday morning because my stuff still needed to get to the Goodwill, and this request completes with no problems. My Helper is great, we put several boxes and bags into his truck, and off it goes to the Goodwill without my even having to unload it. My Sunday afternoon Dolly arrives in a pickup truck without a cover. Right when he pulls up, it goes from “raining” to “pouring,” and after assuring me that it’ll be okay and we shouldn’t try to reschedule, I watch him try to line his truck bed with plastic. WHILE IT IS STILL RAINING. Since it’s Seattle, the rain eases up within a few minutes—but doesn’t stop—and my Helper loads up his dolly with a few boxes and takes them out to the truck. Then he removes the plastic he has placed over the truck bed and tries to shake the water off. Water likes to cling to surfaces, plus it is STILL RAINING, so this doesn’t really work. So he puts the plastic back on the truck bed and starts putting the boxes on the plastic. I have about ten different concerns at this point, starting with the fact that the plastic isn’t fully covering the truck bed and there are deep puddles of water in the places the plastic didn’t reach, and ending with the fact that he’s not securing these boxes (several of which contain breakable items) in any way. Just… on the truck. I tell him this isn’t a good time to move my stuff and cancel the Dolly, which costs me $24. After I get my boxes back, I call Lyft. I take a different Lyft back to my apartment, and ask the driver if he wouldn’t mind taking me and a full load of boxes back to the Sip & Ship in exchange for a $20 tip. He’s game, so we get that done and I ship off ten boxes. 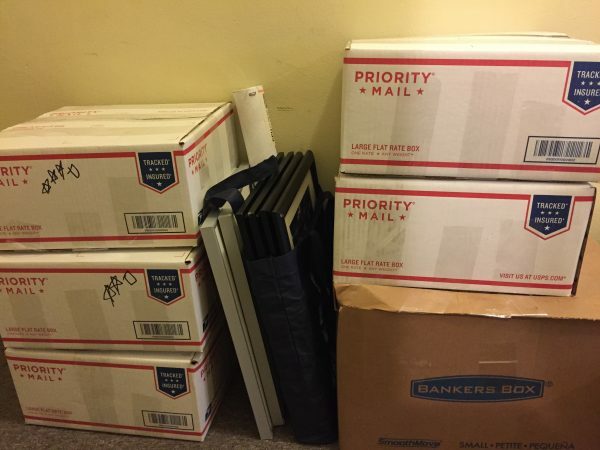 Most of them are Priority Mail Flat Rate boxes, which is why I get all ten boxes out for only $284.50. There are still a few boxes left that didn’t fit into the Lyft, so I’ll take them to the Sip & Ship this afternoon when I go to pay my bill for the dishes and Christmas ornaments. Then I will be DONE WITH PACKING and DONE WITH SHIPPING, and all I’ll have left to do is move.